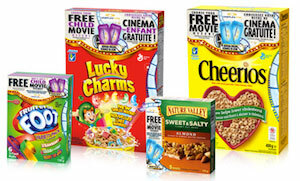 Yet again, General Mills and Cineplex have joined forces to offer movie bluffs tickets inside select products. There are few steps to follow in order to claim this special. The first one consists of getting your hands on a code found in specially marked packages of General Mills products. The second one is to apply your code over at Cineplex.com in order to claim your free ticket(s). There isn’t anything stopping you from stacking up on voucher codes. The products in this special offer include everything from Lucky Charms, Cheerios and Oatmeal Crisp cereals, Dunkaroos, Fruit Gushers and Fruit by the Foot snacks, Nature Valley granola bars as well as Old El Paso products. Certain conditions apply depending on the products you choose to purchase and the month during which you are planning on going to the theatre. Learn more details by visiting this promotions page over at Lifemadedelicious.ca. Have you ever participated in this special offer? Do you have any feedback you can provide to other readers? I CAN’T REEDEEM THE FREE TICKET,NEED HELP LIKE EVERYONE ELSE…. thank you greatly ,it will give Joslyne a night out!! to give my daughter a break from college,and work. Hi Anita, glad we could help. How do you redeem the free movie offer?